Not sure what else to write about tonight, so here's a restaurant review that's long overdue. On my date night a couple of weeks ago, Carol and I checked out this old stodgy New York institution. Overall I think I was more impressed with the ambiance and history than with the overall meal. Both of us actually found pieces of shell in our oysters. I was also surprised that our clam chowder wasn't piping hot. But our entrees were really good. Carol got the broiled cod and I had a broiled monk fish. The sauce seemed to go perfectly with the meaty flavor of the fish. If you're expecting top quality presentation and attention to detail, I'd choose another restaurant. But if you're looking for a good variety of oysters and well prepared fish specials - and like hearing subways rumbling while you nosh - check this place out. I ate here for work a while ago. 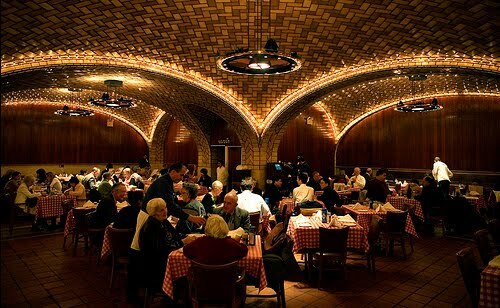 I was blown away by the vaulted ceilings and the selection of oysters. One of the guys we were eating with got some oysters that were 10-12". This was the first time I actually liked oysters and I'm sure the wide array of oysters we sampled had a lot to do with that. 12 inches?! What?! Are you sure that wasn't a razor clam?